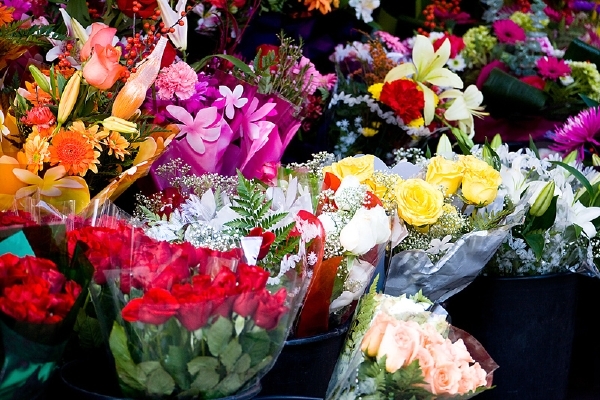 If it were up to Josh, he'd buy his wedding flowers from a sidewalk vendor and call it a day. Editor's note: The Reluctant Groomzilla will be here this Friday, March 28, to do a live reader Q&A from 11 to noon. Is there something you've been dying to ask him? Now's your chance. Submit questions here. Those of you who have lived in the District—or at least gone out to bars in Georgetown, Foggy Bottom, and downtown DC—probably know the Flower Guys. There are two or three who come around to the bars every evening selling flowers—usually roses. They even came by a restaurant I was at a few weeks ago. Talk about a great sales pitch. Can any guy with a girl afford not to buy one without looking like a cheapskate? Of course, you look pretty cheesy if you do. You can’t win. Anyway, after spending almost 48 hours of my life meeting with florists, I was pretty much ready to find those guys and have them do our wedding flowers. Either that or one of those guys with a flower bucket at a Metro station. They usually have a good variety, right? Flowers are definitely falling into the “as long as I don’t hate them, I don’t care” category. Luckily, my fiancée is not into pink or white flowers either, so I don’t have to worry about the reception looking like a Pepto-Bismol nightmare. A good thing to keep in mind when meeting with florists is to bring something to help you stay awake. By the time we met with the third guy, I needed a rose thorn to prick myself with so I wouldn’t fall asleep. He did get my attention when he suggested a water wall at the foot of the escalators near the entrance to the ballroom. I thought we should have the guests bob for place cards, but for some reason this idea was shot down. The amazing thing is that you can get just about any flower you want at any time of year. Apparently there are these massive greenhouses in Holland that look like that scene from The X Files movie where Mulder and Scully get attacked by bees. They’re computerized and have huge conveyor belts to move the plants into different climate zones in the same building. It’s too bad our honeymoon is already planned. If florists want to get the grooms involved, all they need to do is talk about this stuff more. In the end, I think my fiancée and her mother picked a great florist. He has lots of cool ideas, and I think he will be fun to work with. Now I just need to e-mail him about incorporating Venus flytraps in the centerpieces. . . .